If you imagine what Lost in Translation might have looked like if it was made to look and feel more of a Hollywood product, instead of the innovative and quietly touching indie drama that it ended up being, chances are that it would have come out looking a lot like A Hologram For The King. There are some similarities between Sofia Coppola’s Oscar-winning film and this one, from director Tom Tykwer and star/producer Tom Hanks, with the basic premise of a washed-up American finding peace and solace in a foreign land, but while Coppola’s film was an innovative and quietly touching human drama that took advantage of its bizarre and other-worldly setting of Tokyo, Japan to offset the main characters’ lost nature, this is a film that’s much more by-the-numbers and ultimately blends in with other Hollywood-friendly culture clash films without anything to make it really stand out. Hanks is Alan Clay, a salesman who is going through a bit of a rough patch in his personal life – his wife has left him, his job is on thin-ice, he can’t provide for his daughter’s college education, and there appears to be a small hump-like cyst forming on his back. On top of all that, he is flown out to Saudi Arabia to pitch a revolutionary hologram communication system to the King – only to find that not only is His Majesty not there, and hasn’t been there in months, but his team is underequipped and all but neglected by the Saudi government. This would drive anyone off the deep end, but while Clay is almost certainly hanging on by a thread he soon finds joy in the culture and climate of the country, engaging in personal friendships with his driver Yousef (Alexander Black) and later his doctor Zahra (Sarita Choudhury), and eventually reclaiming his stolen sense of happiness. On the surface, it’s reasonably harmless; there are a few chirpy and funny moments scattered here and there, many of them anchored by a reliable lead performance by Hanks, and Tykwer’s direction is straightforward and not afraid to become stylised every now and then. The problem is, you’ll likely forget about it not long after leaving the auditorium, which speaks volumes about how it doesn’t entirely translate its intentions towards its audience. We’re even struggling to remember certain plot details aside from the basics ourselves, and we only saw it less than 24 hours before writing this review. All you’ll really end up remembering from it is the Saudi desert backdrop, which in fairness does look astonishing, and the fact that a recognisable face such as Hanks’ is starring. Other than that, you’ll honestly struggle because so much of Tykwer’s screenplay – adapted from the novel by Dave Eggers – falls very much into typical culture clash tropes, like a misinterpreted joke or trying foreign dishes for the first time, that have been done so often previously that none of it really sticks out. As a result, you don’t remember or even care that much for the situations or the characters involved, and they quickly become faded fragments when the credits start playing. It’s also a script that probably looked and played out a lot better in the book it’s meant to be adapting. There are a number of sequences and character arcs that end up going nowhere or arriving without a clear punchline – for instance, Yousef has a mini-subplot that has him fearing for his own safety when he begins messing around with another man’s wife, going so far as to check his car for explosives; but in the film it’s resolved in such an afterthought manner that there doesn’t seem to be much point to it at all in hindsight, which makes one wonder if it was given a lot more time to develop and reach a more natural conclusion in Eggers’ book. The same can very much be said about the film’s ending, which hastily wraps up a number of loose ends in a matter of seconds, and by the time it fades to black you’re left confused and unsatisfied with its all but abrupt and drama-free ending. Again, one must wonder how Eggers’ book did it differently, if at all, because on film it doesn’t feel like a satisfactory conclusion in the slightest, and it even feels a little incomplete despite dedicating a line or two to important threads that are thrown at you without any build-up or pay-off. Other than that, there’s not a lot to really take away from this film. The acting is fine, the direction is fine, the cinematography is fine, virtually everything about it is fine and doesn’t go anywhere above that mutual verdict; it’s just a standard but ultimately forgettable movie that should cater to fans of Tom Hanks’ filmography and his star appeal, but not many others. Like us, you’ll struggle a little bit to remember even a few plot points not long after seeing it, as well as much of the comedy and many of the characters, while just makes A Hologram For The King all the more forgettable. If you want a film that does the whole “struggling American finds peace in a foreign country” bit much more effectively and, most importantly, memorably, then definitely check out Lost in Translation if you haven’t already; like we said, it’s a quietly effective little movie that does its job to a satisfying and imaginative degree. If you want the Diet version, check this one out instead; it’s just as flat as it sounds. 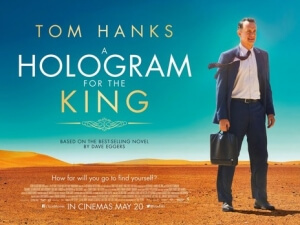 A Hologram For The King is a harmless but ultimately forgettable star vehicle for Tom Hanks, who just about carries the film with a reliable performance, which unfortunately isn’t enough to disguise the fact that it contains nothing worth remembering in retrospect, not even its abrupt ending which leaves the viewer in an unsatisfied mood on their way out of the auditorium.